This rare Bulb. 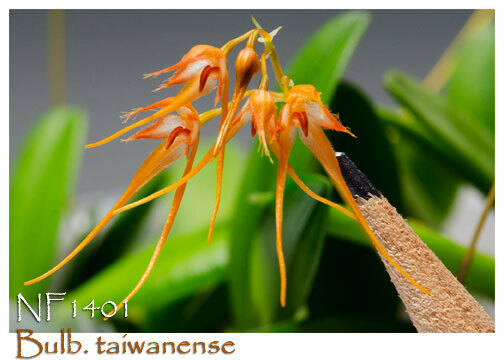 taiwanense is one of the smallest in the genus, a true mini-miniature, its plant size being only 2.5-4cm. Its creeping rhizome will produce 0.8-1cm. spring flowers on a 2 ½ - 4" inflorescence, each inflorescence carrying 3-8 fringed flowers. Easily grown and flowered under low light with Phalaenopsis, this is a true gem for any collection. Mounted on a wood slab, they like to be kept moist with good air movement. Very limited. 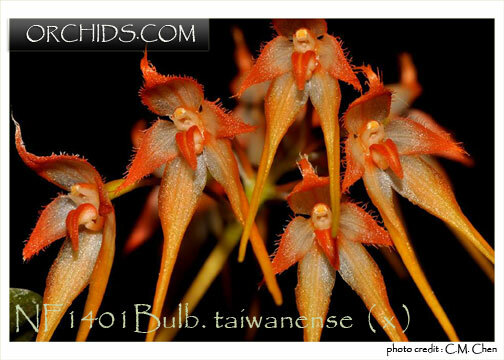 Photo Credit: Mr. Lanfu Wong of Taiwan.